With the 2017 Australian GP in the books, we can now take a closer look at the package that Ferrari brought to Melbourne. We can’t but begin our analysis with one of the hottest tech topics of this past winter, front suspensions of course. The controversy started back in December with a letter written by Ferrari’s Simone Resta to the FIA, demanding some clarification on the legality of other competitor’s suspension setup. As it turns out, Mercedes and especially Red Bull were forced to rethink their system to conform the new guidelines. We thought for sure from the beginning that Resta’s aim was to have these hydro-controlled suspension packages banned before the opening race. This suspicion is now a certainty. We have in fact some pictures of the Scuderia’s setup. 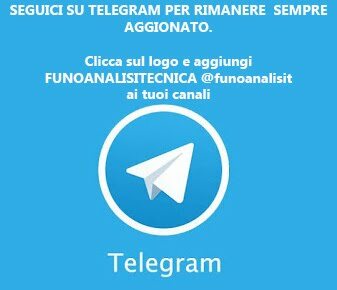 As it can be seen in the picture below, Ferrari went for a more conservative approach, evolving on the 2016 concept: a spring third element. Although the concept is the same, quite a few bits were changed: firstly the helical spring wasn't completely removed but there is also the presence of a Red Bull-ish bellow spring. Also very different is the way the suspension interfaces with the chassis. 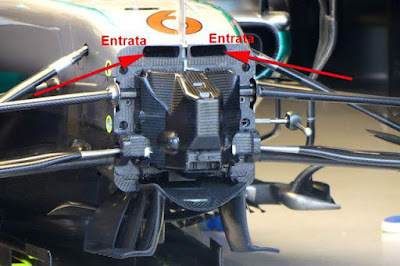 In fact, the push rods are now connecting to the rockers just above the chassis line, taking inspiration by last year’s RB-12. Here’s a picture of last year’s arrangement for reference. Although this is a pretty, there I say it, “conventional” system, it’s yielded very good results both in testing and race. Also very talked-about was the reintroduction of the S-Duct on Maranello’s latest creation. 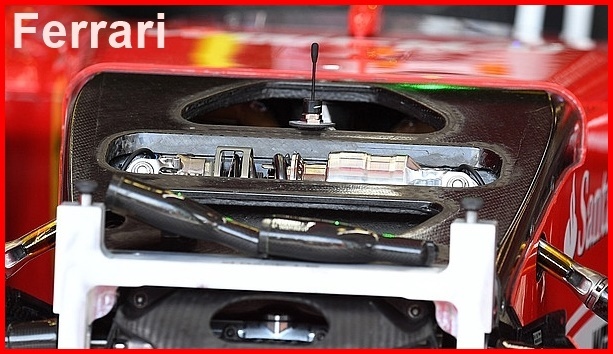 This aero component is not completely new to the Scuderia, which had started experimenting with it long back in 2008. The main purpose of this device is to channel turbulent air from underneath the nose-cone and expel it on top of the chassis right over the front axle line. This helps prevent flow separation from the body of the car, but it also generates downforce in of its own, forcing air upwords. Ferrari has certainly took some inspiration by Mercedes’s W07 when it comes to the positioning of the inlet for the S-Duct. In fact the opening is located very far forward in the nose, allowing for quite a straight pass through the car, offering in turn less resistance. In the pictures below we can see how the air is channeled through two ducts near the top of the nose piece. For comparison here’s Mercedes’s solution. 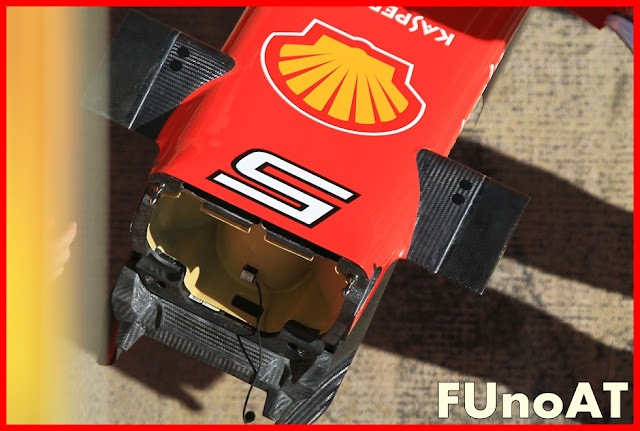 In the SF70-H, the S-Duct is fed through a Shark Mouth-like inlet in the farther part of the nose-cone. 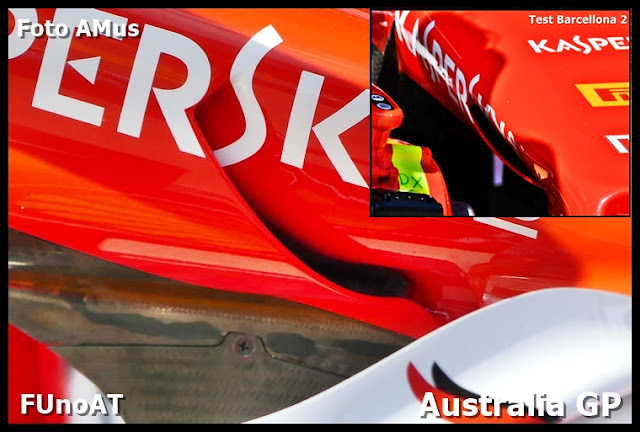 It appears that this opening might have been tweaked for the Australian GP, but it might be an impression given by the different camera angle. This is where the similarities with the 2016 Mercedes end. 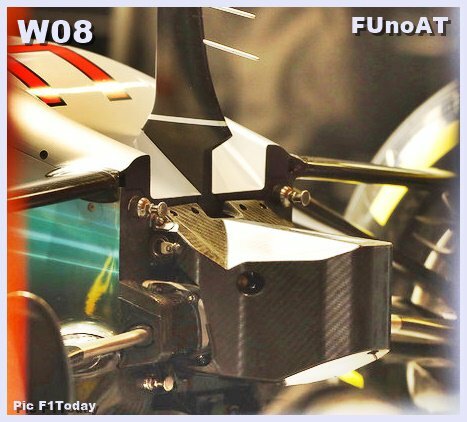 In the picture below we can see a radical cross over of the two channels which was missing on the W07. 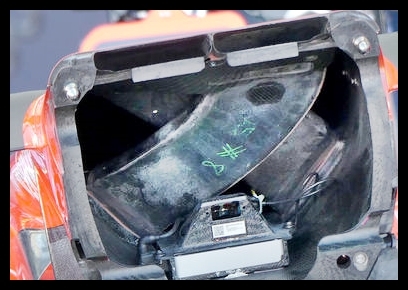 Also, the picture underneath shows how in the W08, the ducts stop in the nose and don’t continue on into the chassis, instead Mercedes engineers have opted for open outlet. 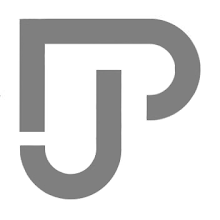 This is an evolution on last year’s design. 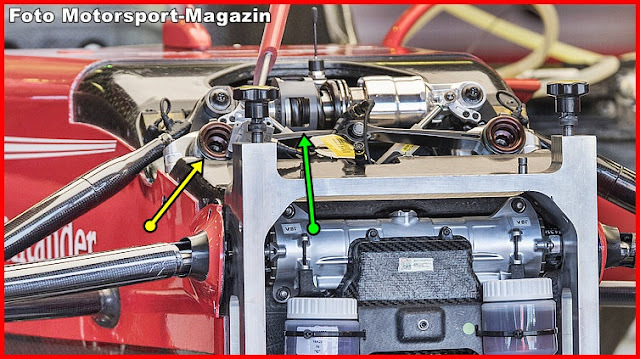 Ferrari, on the other hand, decided to prolong the channels into the chassis and expel the air through a port in the vanity panel over the rear-most part of the upper wishbone. The Prancing Horse team also brought a few aero tweaks to Australia on what we had already seen in Spain. 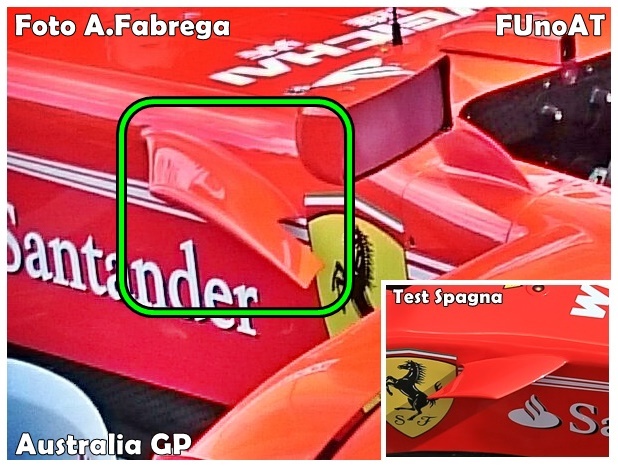 As it’s clearly visible in the next picture, Ferrari has modified their flow conditioner at the side of the Scuderia Shield, increasing its curvature in order to augment the downwash effect, needed to convey more air to the diffuser. Also interesting is a small serration on the inner side of the winglet. The second upgrade concerns the rearview mirrors stalks, which are now rippled and not straight as we had seen in Barcelona. These new supports act much more like a flow conditioner to make the innovative side-pods inlets work better and harder. The updates don’t stop here: the floor and engine cover also received a refresh. In particular, the ripple aside the pods on the floor were enlarged. This is aimed to improve the quality and the amount of airflow directed to the rearmost part of the car. This modification could have also been dictated by the fact that the flow conditioner at the front of the side-pods now a more dramatic curvature to increase the downwash effect, i.d. force the air down directing it towards the floor of the car. 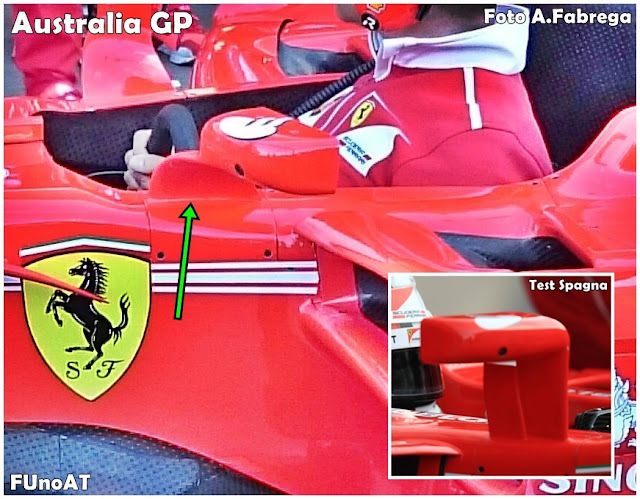 Compared to the tests in Catalonia, the hot air exhaust outlet at the end of the engine cover has also been enlarged. Temperatures (for both air and track) in Melbourne were considerably higher than those in Barcelona, thus Ferrari engineers opted for more airflow out the back of the car, in order to maintain cooling and, moreover, reliability at good levels.